FTP client for file transfers. Is there a better alternative to SimpleFTP? Is SimpleFTP really the best app in FTP category? Will SimpleFTP work good on macOS 10.13.4? 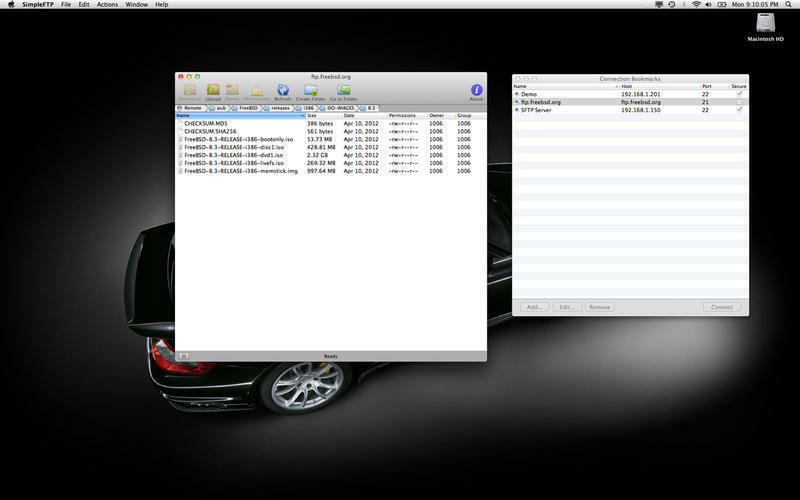 SimpleFTP is a powerful yet easy to use FTP/SFTP client for the Apple Mac. SimpleFTP is a file transfer product, modeled on the RFC 959 File Transfer Protocol (FTP) Internet standard, that emphasizes simplicity and ease of use. Unlimited simultaneous connections to different servers. Seamless multi file and folder transfers and deletion. Fixed symbolic link resolution when connecting to SFTP servers. SimpleFTP needs a rating. Be the first to rate this app and get the discussion started! Supports the most popular UNIX, Microsoft Windows, IBM OS/2 and Apple Macintosh FTP/SFTP servers. Supports regular FTP, FTP over TLS and Secure FTP. Smart Synchronization, including Upload only or Download only modes.